Welcome to the second installation of An Adventure in Small Games (you can read the first one here), a monthly series focused on games that cost less than $20, ideally less than $10. In this series, Eve Golden Woods will focus on indie games and what they have to offer the world of gaming. This month Eve focuses on The Dusty Dead, available for free or for $5 for extended content. Buzzfeed quizzes and tarot readings have a lot more in common than you might imagine. They are, after all, both quests to know the self, and they function through the same process of self-interpretation within a structure of symbols. If tarot cards have the edge, then it is surely because their symbols are denser, more saturated and also more flexible. “Which Steven Universe character are you?” has only so many possibilities, only so much room for play and exploration, fun as it might be. The tarot, on the other hand, has seventy-eight cards that may be placed in endless mutating patterns and then endlessly interpreted from there. And yet both indulge the craving people have to know themselves, to understand their own nature. It’s debatable whether or not we actually have a fixed self, or even a single self, but that doesn’t stop us from wanting to pin it down and examine it with a microscope. The flux of everyday thought and feeling within us is a frightening concept. Anything that allows us to feel more certain about who we really are is a comfort. This is the fundamental backdrop against which The Dusty Dead (The Dusty Dead Viral Identity Quiz, to give it its full name) plays out. Designed like a Buzzfeed quiz—rapaciously imitating the weird fannish sleaze and in-jokes of those tacky personality tests while at the same time presenting us with an alien narrative saturated with strange unfamiliar names and ominous events—The Dusty Dead seeks to expose the narrative wiring that underpins our collective engagement in and identification with fiction. It imagines a series of novels, a ’90s cartoon, a 2003 TV series, and even an anime focused on a world where magic, cyberpunk, space opera, and the apocalypse bleed into a dense network of characters, places, and events, a thorny tangle of stories that cross-reference and overlap. The closest real-life analogues are mega-franchises like Star Wars, Marvel, or Transformers, series that have comics, manga, film, cartoon, and anime adaptations. Unlike The Dusty Dead, however, almost all of these series began as visual media, whether as films, cartoons, or comics. It is much rarer for books to receive the same kind of cultural status (only The Lord of the Rings and Harry Potter come close, and neither of those has ever received an anime or manga adaptation). This range of mediums allows The Dusty Dead to be flexible, to adapt to each reader’s imagination and fit itself into whatever kind of narrative they usually engage with, while also permitting commentary on the way stories change when they move from medium to medium. Which of course raises the question: what effect does the making of a personality quiz have on the story itself? “The skies have grown yellow-green with the last gasps of Hollotrax. Rain like a goddess’s anger falls from the sky. Where do you shelter?” So opens The Dusty Dead, the first question already entangling in a maze of signification that you have no markers for and no way of navigating. The music is startlingly intense, demanding your concentration, speeding you along as though leading you towards some terrifying climax. Your options only deepen the mystery. Each of the four choices is a window into a different kind of world. The first imagines the desiccated shell of a huge and ancient insect, Ghoran-Garen the Cloud Mantis, populated by his presumably much smaller offspring. The second mentions a Lich Lover, flipping us from a grotesque menagerie of enormous insects to the mystical realms of something more like D&D. The third talks of plasma shields and dying stars. And the fourth of runes shaped in the tangled roots of trees. This is a world where nothing is reliable. Science and fantasy blur into one heady mix of impossibility. All outcomes, it seems, are equally likely. They also have a common factor: all of them suggest a vast space beyond the reader. It reminds me a little of Adventure Time in its mix of magic and science, but more than that it reminds me of the dense word-jungle that is the Bas-Lag trilogy by China Mieville. For those unfamiliar with his work, the Bas-Lag trilogy takes place in the world of Bas-Lag, focused mostly on the crumbling metropolis of New Crobuzon, the remnant of a once-powerful empire now dissolving. Mieville has a knack for over-saturating his writing with information, so that it crashes against the reader’s mind and leaves them overwhelmed, a feeling almost like engaging with reality. Both the Bas-Lag novels and The Dusty Dead awaken the imagination to action almost as a defensive response. In the face of this wave of names and words and worlds you can’t possibly know, you focus on one and begin to map its internal coordinates. You imagine, perhaps, the translucent chitinous exoskeleton of Ghoran-Garen, opalescent against the yellow-green sky. It smells not of rot or mold but of sweet dust. Tapping it creates a ringing sound, like wind chimes or whispered chanting—though this is unwise, given the many children of the giant who come rushing to the sound to look for prey. You find a nook that someone used before, where they have left prayer-beads and a small statue of an unknown saint, and hunch in to wait out the rain, your diamond-edged sword across your knees. Of course, this is only a fragment. Only a dream. I find it fascinating though, that I have seen other people who played the game composing their own mini-narratives over Twitter, happily pulling meaning from this gulf of language. That is always the first instinct we have. I think that’s only strengthened by the fact that the you of the central narrative in The Dusty Dead is a total unknown. The structure of this question is a perfect tension of the known and the unknown. The pacing suggests a summary of a familiar story, and indeed many of the key facts are half familiar. All of us know narratives where key items, be they heart shards or deactivated portals, must in some way be amassed by the protagonists. And though forgotten memories are an unusual choice of enemy, the idea of repetitive fights against goons of an enemy are equally familiar. Not content to play with the underlying conventions of the personality quiz, The Dusty Dead layers in a further element. As the quiz continues the music and visuals distort, skips, and glitches seeping into the soundtrack while the screen seems to flake away, revealing a cold hexagram pattern set against some vast inexplicable structure. 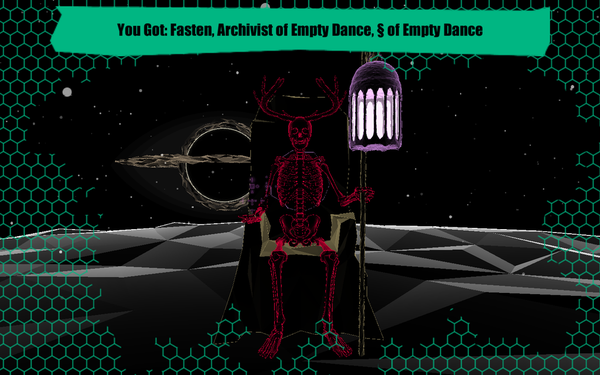 The Dusty Dead is like Mark Z Danielewski’s House of Leaves; there is a deliberate blurring of the layers of reality present. The Dusty Dead may not be real, but within the confines of its own structure there exists a bleeding of the fictional and nonfictional. In the constructed world where the Dusty Dead existed, there is then an intrusion of the fictional universe they know, and this collectively seeps into our reality, cracks opening upon cracks, a chasm that makes space for unknown and mysterious forces to enter into. This is particularly interesting given that The Dusty Dead Identity Quiz is in fact only the first part of a projected longer work. I have no idea what the longer project might entail, but as it stands I find myself deeply intrigued by the possibilities. 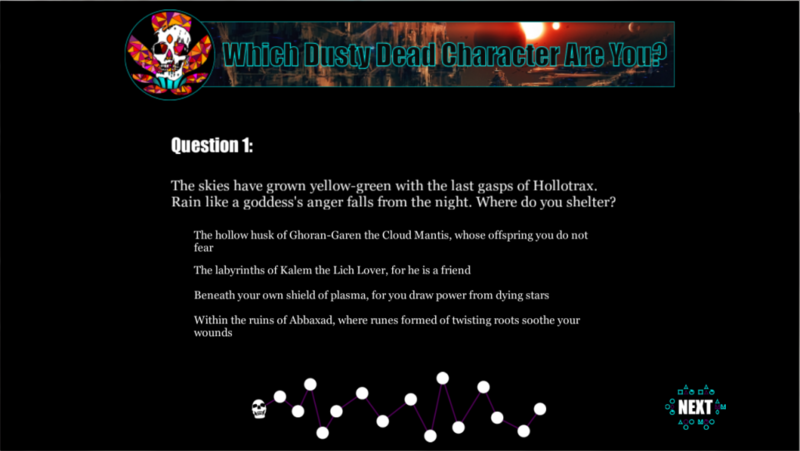 Given these layers of intention and reality, and the fact that the character results at the end of the quiz are procedurally generated, it might be easy to assume that the quiz element of the game is a mere construct serving to expose some ideas that will be developed and explored later by Silverstring Media. 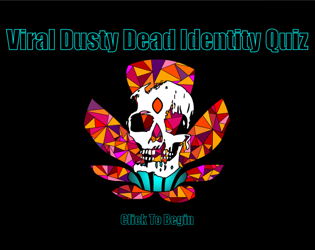 What I find most interesting though is the way in which The Dusty Dead does function as an identity quiz, almost in spite of itself. In the narrative spaces that the names and places leave for you to fill, the stories you end up telling almost inevitably reflect something true about yourself. Like the tarot, the conclusions you draw from the symbols in front of you form a map of your own consciousness, a pattern that reveals the you of that moment, even if it says nothing about your past or future experiences. What stories did I imagine? Well, once there was P’azzak the Strong, collector of hearts, and once, for reasons that may be revealed, she refused to add a heart to her collection.